Since yesterday was Father’s Day in the United States, today’s Music Monday celebrates the special bond between dads and their kids. There are many songs that capture this unique relationship, but a song that was always powerful and poignant to me was one of Paul McCartney’s lesser known pieces: Put it There. Released in 1990 as a single to McCartney’s 1989 album, Flowers in the Dirt (affiliate link), the song reached number 32 on the UK singles chart. McCartney’s eighth solo studio album, Flowers in the Dirt was considered a major return as its release inaugurated his first world tour since his Wings Over the World tour in 1975/1976. The album’s musical quality was widely celebrated, earning McCartney his best reviews in years. I share the same thoughts as those reviews, having always found the album beautifully written and masterfully performed. Notably, the album has added meaning because I attended the April 1, 1990 show of the Paul McCartney World Tour at UC Berkeley‘s California Memorial Stadium. I even found a setlist from the concert (complete with links to YouTube clips of each song performed)! Having always found “Put it There” a touching tribute to a unique father/son relationship, the track took on added meaning when I became a dad to my two sons. If you listen to the lyrics (and/or read them — they are included below), you will understand the sweet, yet understated emotion of what the song is communicating: unconditional love. Sometimes, as the song explains, simply having someone to hold your hand can fix any problem — or at least make you feel better while you confront it. Shamefully, the importance of fathers is often overlooked, but at least in my experience, my father (and, in fairness, my stepmother too) has made all the difference in my life recently. In my own experience, knowing someone is unconditionally in my corner has made all the difference. My grandfather filled that role for me and I plan to do the same for my sons. Surely as they grow older their problems won’t be as easily resolved as they were as they are as children, but knowing they are loved and supported without question will always be essential to their well being. Although my connection with my Dad was, unfortunately, interrupted for several years, I am grateful to have a renewed relationship with him. I am also thankful my sons can “put it there” — not just with me, but with my Dad as well. Likewise, I look forward to continuing this tradition with my son’s children in the future. And so, if you are thankful for your father, put it there! I Want To Show You I’m Your Friend. That’s What The Father Said To His Younger Son. Today’s Music Monday was inspired by a viral video currently making the rounds — from PBS of all places: “Mister Rogers Remixed: Garden of Your Mind” by Symphony of Science’s John Boswell. The video is a tribute to the iconic show Mister Roger’s Neighborhood — which was created and hosted by its namesake Fred Rogers. Mister Rogers was always intriguing in his own unique way, but he was never this cool! For those who remember watching Mister Rogers as children, this video has special significance. The show initially aired in 1968 and rand for 895 episodes, with the final episodes having been filmed in December 2000 and airing the following August. It reached its peak viewership in 1985, when 8% of households in the United States were watching the show. Each episode began with Mister Rogers coming home, singing his theme song “Won’t You Be My Neighbor?“and changing into sneakers and a zippered cardigan sweater. In a typical episode, Mister Rogers might have a conversation with his television audience, interact with live guests, take a field trip to such places as a bakery or a music store, or watch a short film. Typically, each week’s episode explored a major theme, such as going to school for the first time. He even break-danced! Each episode included a trip to Rogers’ “Neighborhood of Make-Believe” featuring the ever-famous trolley with its own theme song, a castle, and the kingdom’s citizens, including King Friday XIII. Mister Rogers often fed his fish — originally named Fennel and Frieda — during episodes. Originally, most episodes ended with a song entitled “Tomorrow”, and Friday episodes looked forward to the week ahead with an adapted version of “It’s Such a Good Feeling.” In later seasons, all episodes ended with “Feeling.” Speaking of the song “It’s Such a Good Feeling,” consider this unique cover of the classic Mister Rogers’ song. Today’s Music Monday selection — “Hypnotize” by System of a Down — marks the date on which the Tiananmen Square protests were violently ended 23 years ago today in 1989 in Beijing, China by the People’s Liberation Army. The demonstrations, which had begun on April 15, were inspired by astrophysics professor Fang Lizhi who, upon his return from teaching at Princeton University, began speaking out about liberty, human rights, and separation of powers. Notably, Fang — who in a 1988 article in the Atlantic Monthly was dubbed “Chinas’s Andrei Sakharov” for his characteristic flouting of norms and outspoken beliefs about thinking individually — died on April 6, 2012. An obituary about him in the New York Times provides an insightful overview of his life and impact. Fang’s ideas inspired students who initiated protests in December 1986. The chief issues included demands for economic liberalization, democracy, and rule of law. The Chinese government was greatly concerned by these activities and accused the students of fomenting turmoil. Unrest finally culminated on June 4, 1989 when the Chinese Army was dispatched to Tiananmen Square with orders to clear the square by 6:00 am. By 5:40 am — after the Army had wounded and killed several hundred students who had refused to disperse — the Square had been cleared. 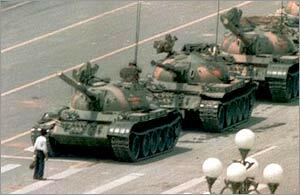 One of the more iconic images that emerged from this unfortunate ordeal was a picture (included in this blog post) of an anonymous man dubbed “Tank Man” who stood in front of a Chinese Type 59 tank on June 5, 1989 (the morning after the Chinese military forcibly removed protestors from Tiananmen Square). “Hypnotize” — which was the lead single for the System of a Down’s album of the same name, was released on November 22, 2005 — was chosen as today’s Music Monday because Tiananmen Square is mentioned in the lyrics (see below). Why don’t you ask the kids at Tiananmen square?